Beechview mural. All photos by Brian Conway. 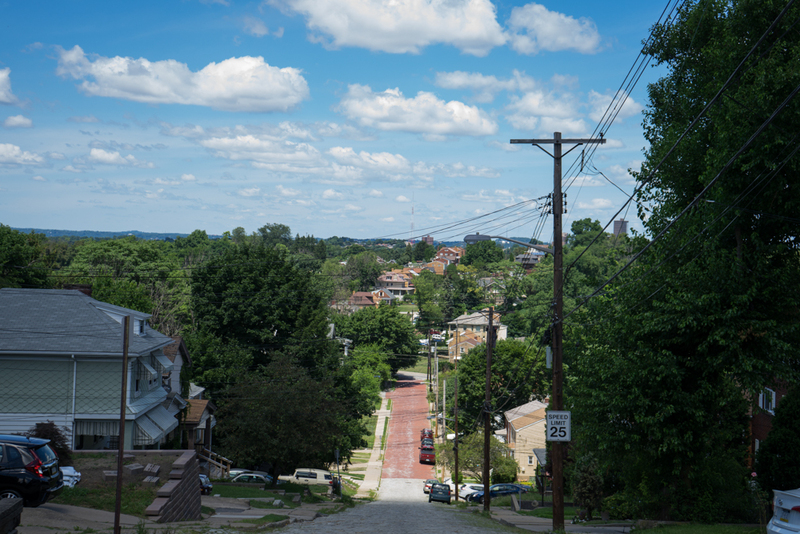 Beechview, like so many Pittsburgh neighborhoods, boasts scenic views, affordable housing, and a central location. 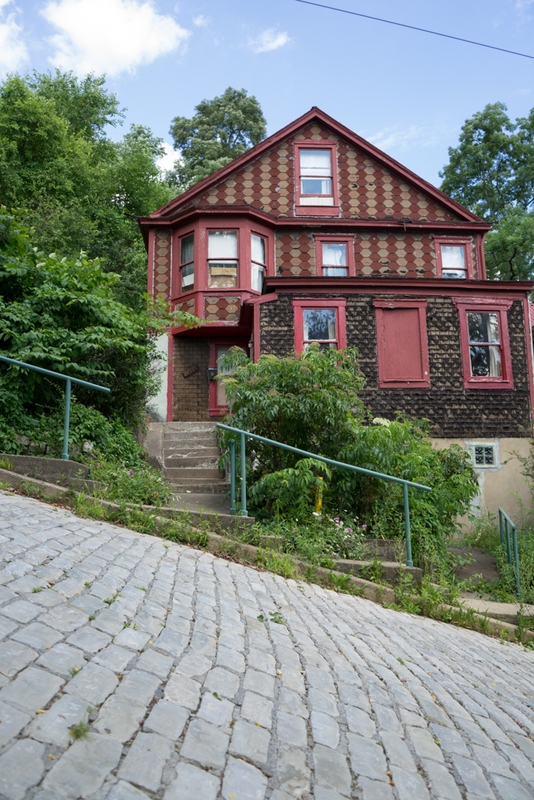 What makes it truly distinctive is its people: Beechview is one of the city’s most diverse neighborhoods. Caucasians make up less than 80% of the total population, and Hispanics comprise over 6% of the neighborhood’s 10,000+ residents. While that’s still 10 points less than the national average, it’s four times the norm for Pittsburgh. Another draw for Beechview is that it’s the only city neighborhood where the light rail travels down the main business district. 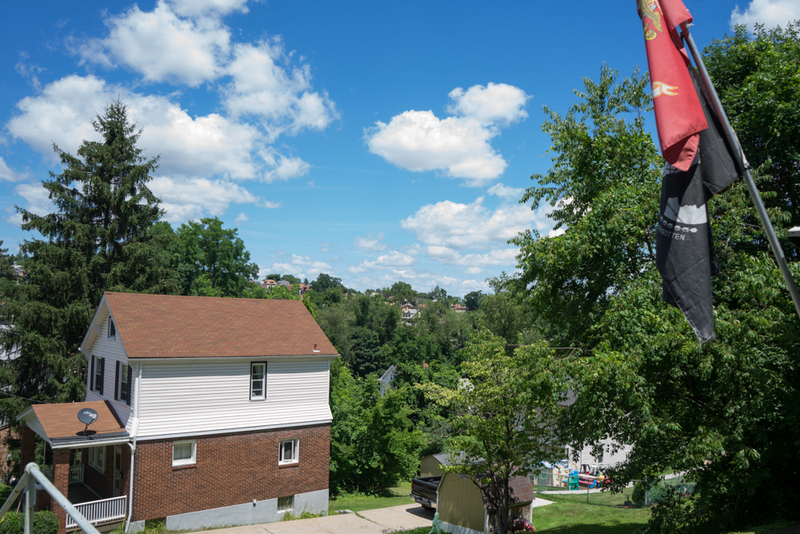 With five stops along Broadway Ave., Beechview residents can walk out their front door and be Downtown in less time than it takes to bake a frozen pizza. 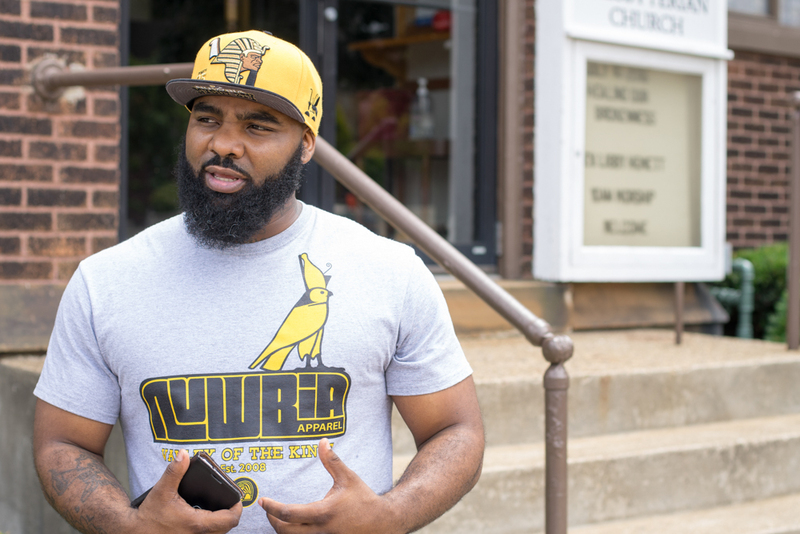 Rapper, activist, and Beechview resident Lhagic has lived in the neighborhood for four years and admires the neighborhood’s diversity. 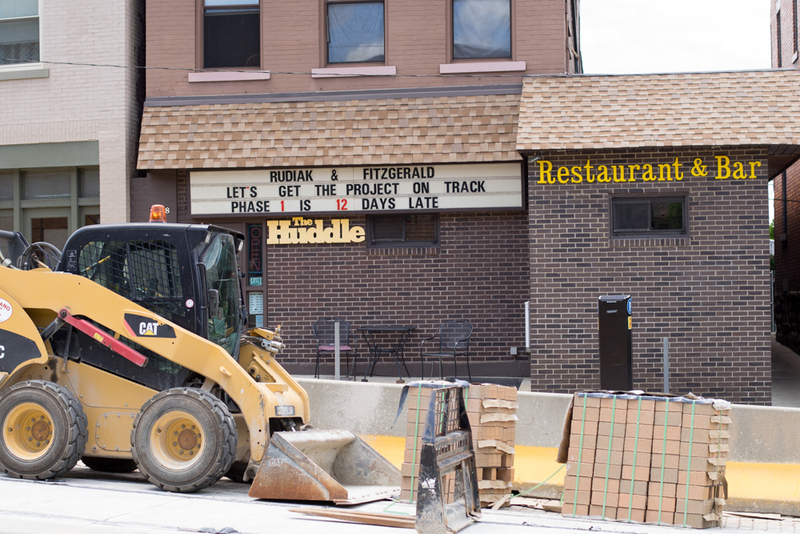 The T is currently under construction, which means there’s no better time than now to head to Beechview to support local businesses. How long will construction continue? A spokesman for the Port Authority tells NEXTpittsburgh that they are on target to finish by September. Even with the light rail out of commission, it still seems like all roads lead to Beechview. Saw Mill Run forms the northern boundary with Mt. Washington. 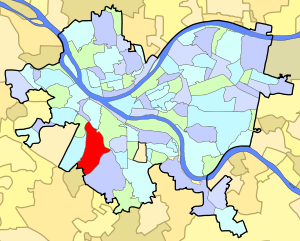 Brookline sits across West Liberty Ave. to the east; Dormont borders to the south, and Route 19 forms the western boundary with Green Tree and Ridgemont. 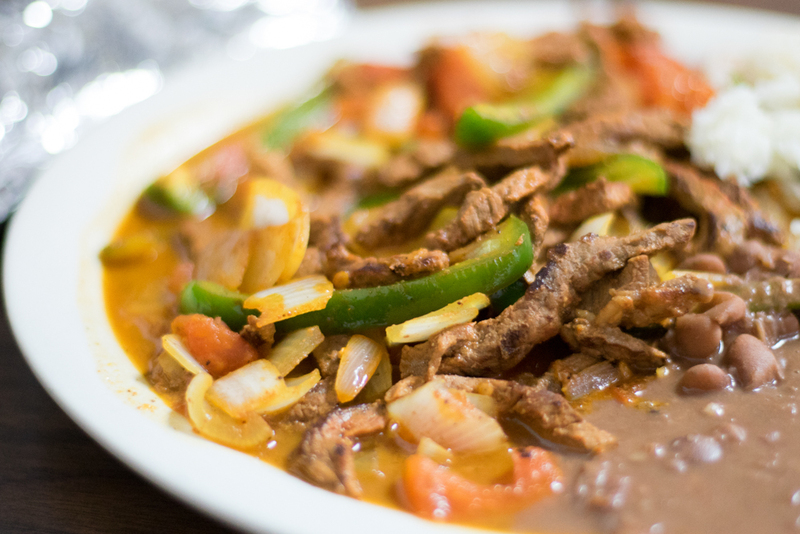 Bistec a la Mexicana at El Milagro. Casa Rasta is owned by the same owners of Las Palmas grocery stores, who in 2013 took over the Beechview IGA and converted it into a hybrid IGA/Las Palmas. Technically named the Market on Broadway Avenue IGA (1616 Broadway Ave.), it’s the best of both worlds. 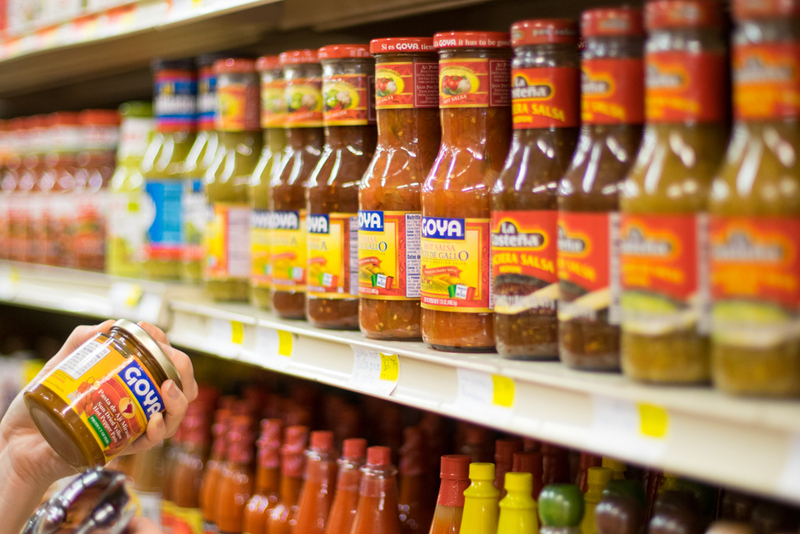 At the deli counter, pick up some sliced chipped ham and prepared fajita meat; the Isaly’s BBQ sauce sits right next to jars of mole. It’s the perfect spot for when you need to pick up some milk, tortillas, or homemade tamales on the way home from work. Also, like at other Las Palmas locations, tacos are made and sold right out in front of the store. Making tacos outside of the Las Palmas/IGA. 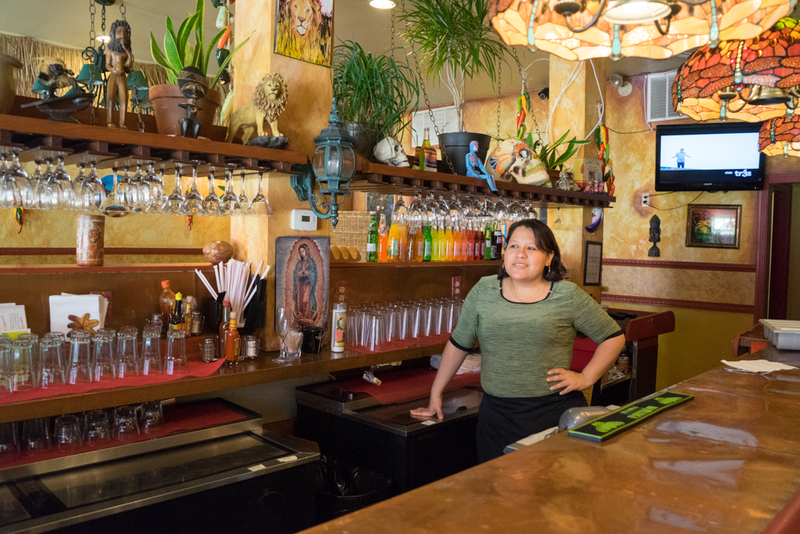 If Mexican cuisine isn’t your thing, Beechview is also blessed with an abundance of pizza. At Slice on Broadway (2128 Broadway Ave.), New York-style pizza is served by the slice or by the pie. Slice is regularly listed among the city’s best, and at less than $2 for an enormous, thin and crispy slice, it’s easy to see why. They also deliver to surrounding neighborhoods. For a slice outside the norm, a true Pittsburgh original can be found on the Beechview side of Banksville Road. 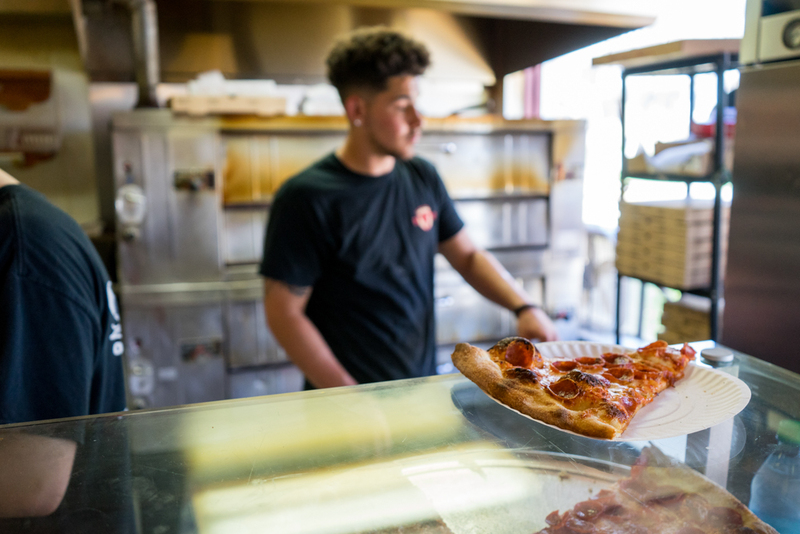 Since 1961, Beto’s Pizza & Restaurant (1473 Banksville Ave.) has been serving pizza with a twist: the cheese and toppings go on the pizza after it comes out of the oven. So much cheese is put on the pizza that only some it it melts, meaning your piping hot pie comes with a mouthful of cold mozzarella. 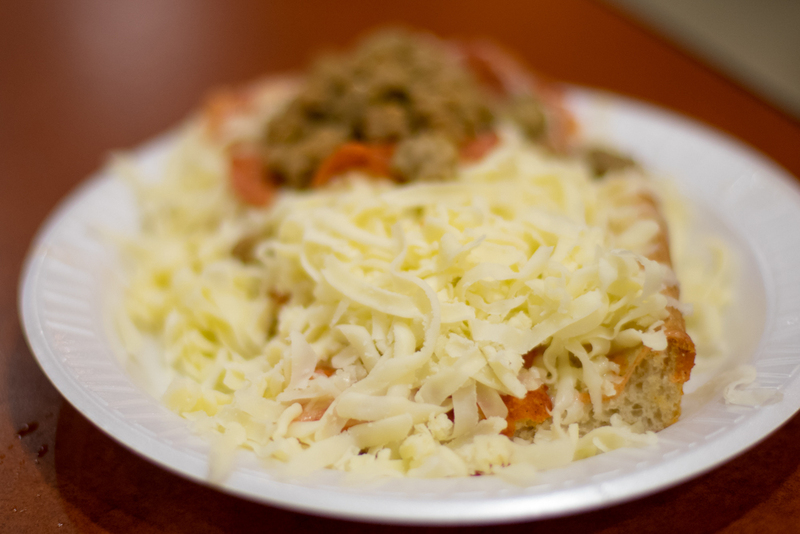 Some people rave about this style of pizza (Beto’s is usually packed), while others prefer their cheese a bit meltier. Hey at least it won’t burn the roof of your mouth. 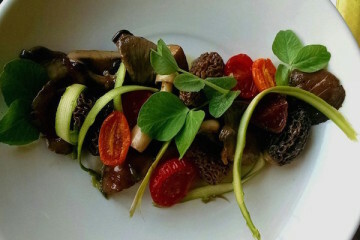 You could ask for the entire thing to be cooked together, but where’s the fun in that? Other food options in Beechview include Feeney’s Weenie’s (2102 Broadway Ave.), an all-beef hot dog shop next to Casa Rasta. One of the owners, Dom DeMarco, says that locals have been incredibly supportive of the business, even more so since construction began on the T. He says that some people in the community have actually offered them donations to help them stay solvent during construction simply because they want the business—and a resurgent Broadway Ave.—to succeed. 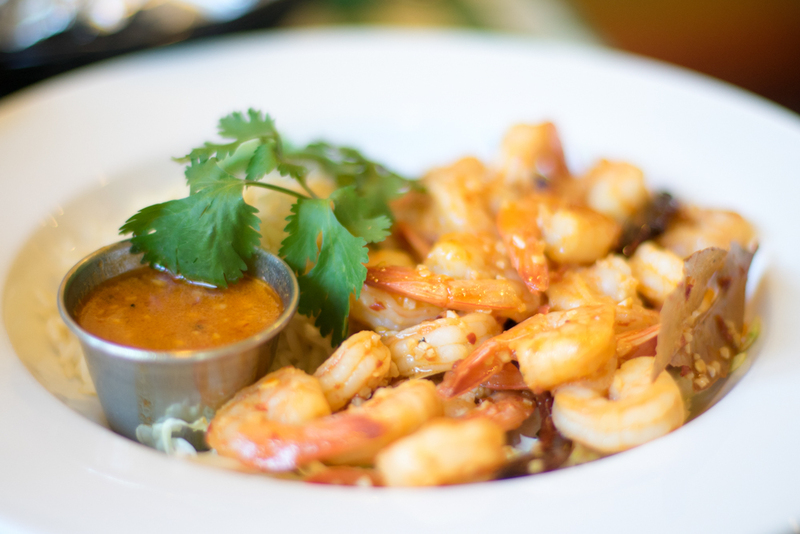 Another dining option on Broadway is The Huddle (1648 Broadway Ave.), an unpretentious local bar and restaurant with an expansive menu, affordable prices and excellent wings. A 16 oz. New York Strip will set you back a dollar an ounce, and the wings come either wet or tanned, the latter meaning the wings are basted in sauce and then baked again for extra flavor. No mention of Beechview would be complete without mentioning Brew on Broadway (1557 Broadway). 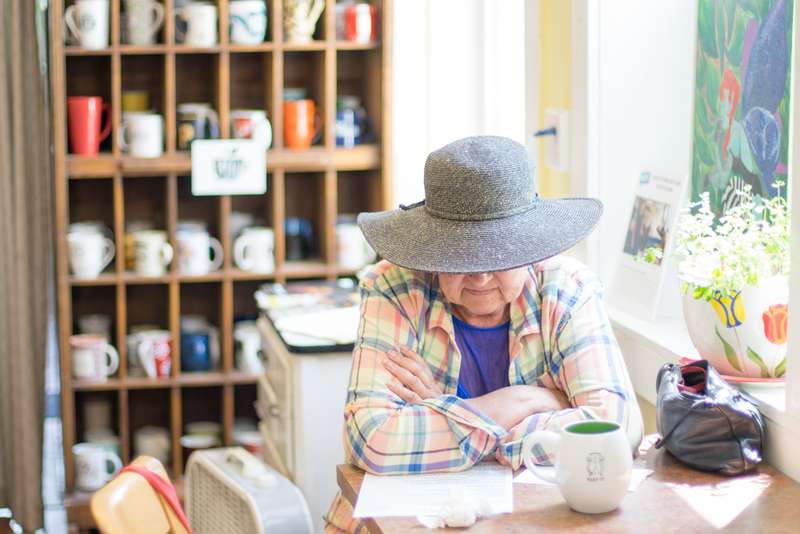 Founded in 2010 as a community space as much as a café, this nonprofit coffee shop donates proceeds back into the community. Regulars can keep a mug on site, and most of the coffee drinks top out around $3. 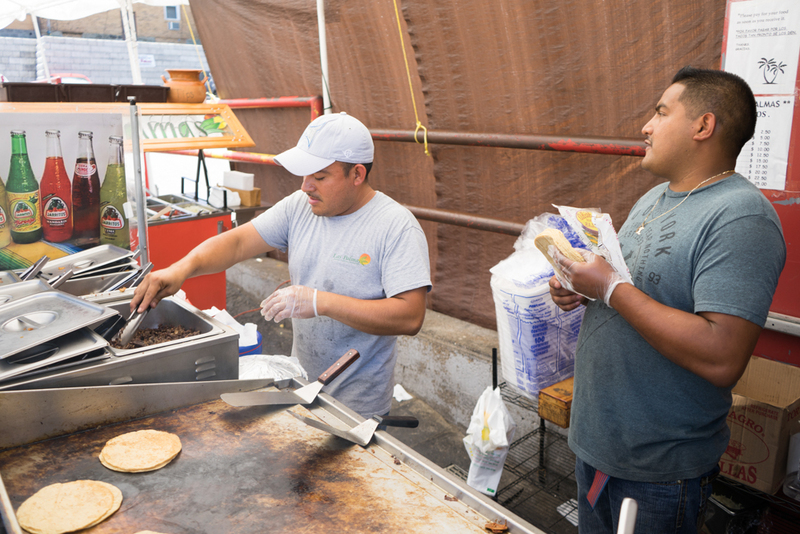 There are fresh-made paninis for sale, as well as Belgian Waffles and bagels. More importantly, Brew on Broadway regularly hosts free event nights. Monday is Jazz Night; Tuesday, craft night; and “Unusual Game Night” falls on Sunday. Check out their Facebook page for updated events listings. Brew is a true gem in the community. A patron reads at Brew on Broadway. 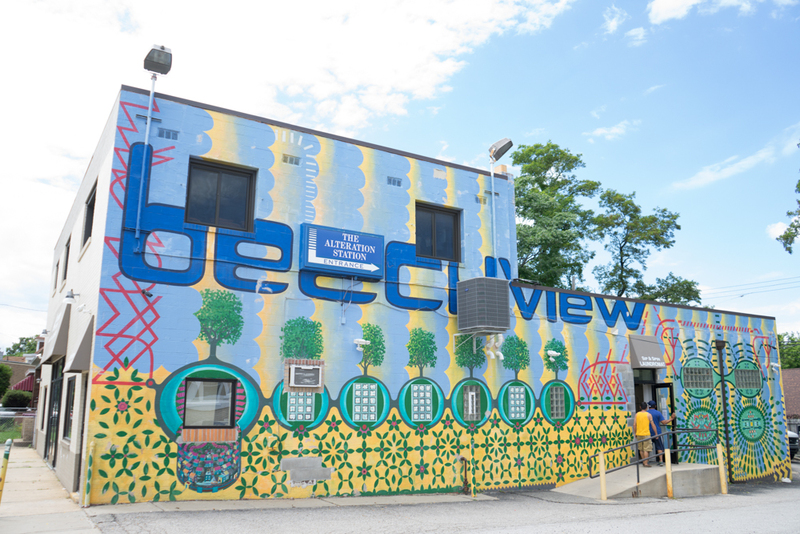 If Broadway is where Beechview comes alive, it’s because there’s more than just food. 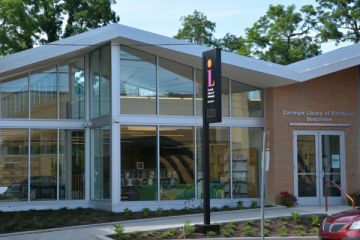 There are churches, barbers, bodegas, salons, laundromats, mechanics, a Senior Center, and everything else a community needs to function, including a slick new Carnegie Library (1910 Broadway). 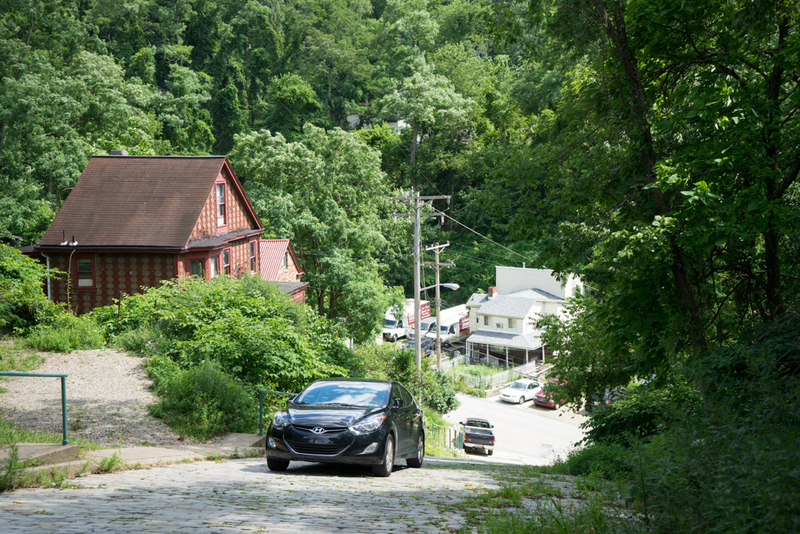 Soon, there will be even more to draw visitors to Beechview. As reported by NEXT, Atlas Development Co. is in the process of buying property at 1600, 1601, and 1609 Broadway for a development which would include an Italian restaurant, diner, a speakeasy/jazz club, podcasting studio, boutique hotel, and residential units and offices. Finally, the northern edge of Beechview, along the border with Mt. Washington, includes the Seldom Seen Greenway. There is no formal signage to enter the greenway, and following directions to it on Waze puts you in an industrial park off Route 51 with no trail access. But if you can find your way there (try the Brashear Trail off of Crane Avenue, by the high school), you’ll find yourself on 90 acres of secluded land that includes Saw Mill Run and may one day be included in the greater Emerald View Park trail system. Camaron al Ajillo at Casa Rasta. Beechview resident Isabela Manrique at Casa Rasta. She says she enjoys living with in a community with other Hispanics and that her job gives her an opportunity to practice her English.